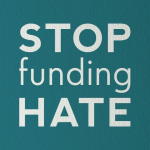 ETA Insurance is proud to support the Stop Funding Hate campaign, which aims to mobilise consumer power to bring about a fairer and more inclusive media. Stop Funding Hate seeks to make media hate unprofitable by persuading companies to switch their advertising away from publications that demonise minority groups – and towards those which report accurately and fairly. Stop Funding Hate opposes all forms of discrimination and hate speech – but the campaign has a particular focus on the three UK newspapers that have been called out by the United Nations over their coverage: The Sun, Daily Mail and Daily Express. As a company we are committed to advertising ethically. We are the first UK insurance company to make a public commitment not to advertise in the Sun, Daily Mail or Daily Express. “We are delighted that ETA Insurance is committed to advertising ethically, and is supporting the Stop Funding Hate campaign. ETA is the first UK insurance company to make this commitment, which confirms their status as a sector leader in business ethics and corporate social responsibility. At a time when thousands of consumers are calling on the companies they shop with to ensure that their marketing lives up to their values, ETA have shown that their ethical commitments are more than just rhetoric.